WMWare has just released its Fusion for Mac OS X. VMware Fusion is a virtual machine software which provide a desktop virtualization environment that allows users to run over 60 different types of x86-based operating systems such as Windows, Linux, Netware, UNIX, Solaris, etc on any Apple Machintosh powered by an Intel Processor. With WMWare Fusion, users can run multiple OS simultaneously. VMWare Fusion makes it easy to install and run the aforesaid OS within Mac OS X without restarting the Mac. For instance, by using a feature called Unity in Fusion, users can just launch and run Windows applications as if they were native Mac OS X applications. Users can enjoy full window tiling and layering support. (Unity only compatible with Windows XP and Vista, for other type of OS, users have to run it within a window in Mac OS X). 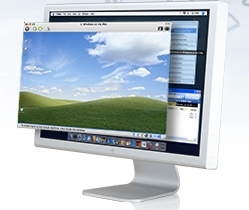 Fusion is the only desktop virtualization environment for the Mac that works exclusively with 64-bit Operating system. It allows up to 8GB of allocated memory per virtual machine and provides full multi-core/multi-processor support. This software also support for copying and pasting between its multiple operating system and Mac OS X.
WMWare Fusion costs you US$79.99. You can read more on its features.